Without a doubt, theHunter: Call of the Wild is the best looking hunting game ever released on a console. The environments you hunt in are lush and gorgeous and realistic, the lighting and weather effects are fantastic, and the animals look great as well. It all sounds pretty good too, by the way. What about the actual hunting gameplay, then? Well, it kind of has some ups and downs, but is mostly good. Exploring the areas and tracking animals is extremely rewarding, but a long slow grind to unlock equipment and decidedly unsatisfying shooting mechanics (at least at first) drag it down a bit. 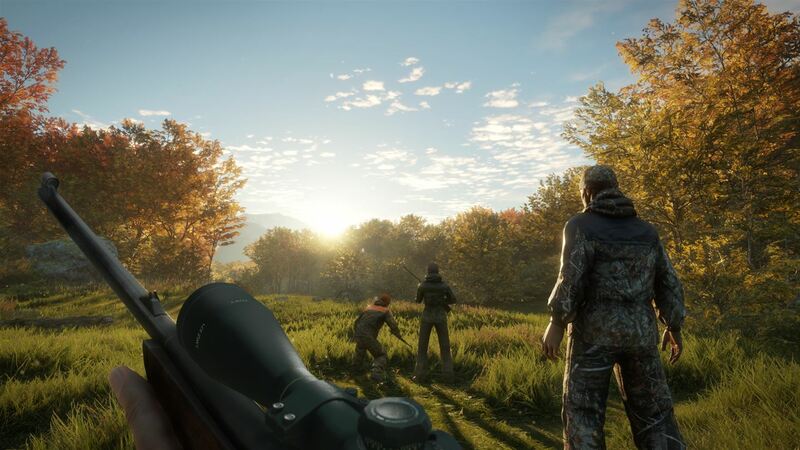 It all comes together into what is easily the best hunting game we’ve seen on consoles in years, though, even with some complaints. 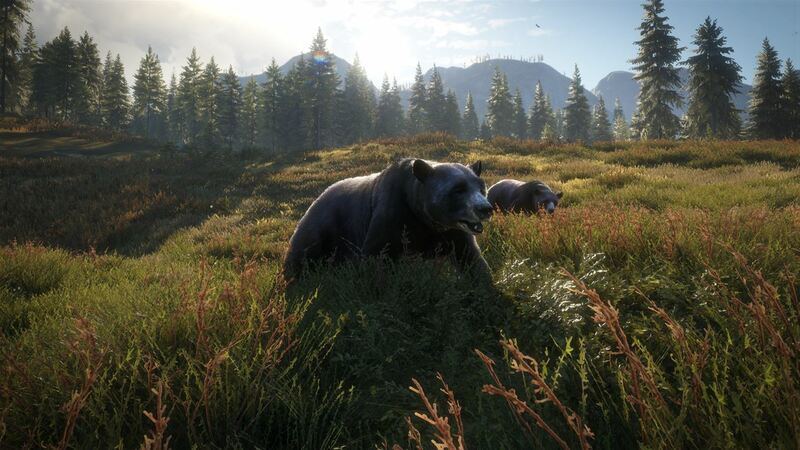 Continue reading our full theHunter: Call of the Wild Xbox One review for all of the details. TheHunter: Call of the Wild features 50 square miles of terrain across two gigantic maps – one in Europe and one in the Pacific Northwest in the USA. Each of the maps is distinct and full of unique plant and animal life and they are both made up of multiple biomes as well, so there are dense forests, marshes, lakes, open meadows, farm fields, steep mountains, and much, much more. I really have to give credit to how realistic the maps can be purely from the fact that I felt totally lost on the Europe map and didn’t know how to hunt it, but was extremely comfortable on the Pacific Northwest map since it is basically my backyard as I live in Idaho. The same techniques and ideas that work in the real world while hunting in Idaho all work exactly the same in theHunter, which is pretty impressive. It is also impressive in that you can play the game for a dozen hours and only see a tiny section of just one of the maps. There is a ton of content here. Actually taking advantage of all of that real estate and hunting the dozens of species of critters that inhabit it is kind of a pain, though, thanks to an extremely slow and grindy unlock system. Doing missions – such as harvesting specific animals on assigned parts of the map or just exploring and checking stuff out – as well as killing anything and everything that you see earns you rifle XP (that unlocks new weapons, scopes, calls, and other items), player XP (that grants you skill points and perks), and cash. Unlocking enough skill points and perks and earning enough cash to buy new gear takes freaking forever and is a very slow and frustrating process. Why is unlocking stuff frustrating? Because your hunter is the most unsure shaky handed terrible shot on the planet when you first start, that’s why! Lining up a shot when the crosshairs are waving all over the place – and holding your breath to steady the shot only lasts a couple of seconds at the start – makes hitting anything you shoot at an adventure. This problem is compounded by the fact that the gun you start with, a .243 rifle, is extremely and unrealistically underpowered and rarely kills anything in one shot so you have to track a blood trail for half a mile through the woods after you shoot it. I say this is unrealistic because my Dad (and me too) has used a .243 for the last 40 years and I can guarantee you it is plenty of firepower to stop a deer dead in its tracks, but they just run off like nothing happened in this game more often than not. You do eventually overcome the frustration and grinding and earn some better weapons – and can apply skill points and perks so you aren’t a jittery terrible shot anymore – and theHunter: Call of the Wild settles into a pretty enjoyable rhythm. The hunting and tracking here is very well done largely because it is rooted squarely in reality and is fairly predictable. You can look at a water source and say “the animals will probably have to come from that direction and walk this way and leave up that draw” and as long as you wait around a while it will most likely end up being accurate. That’s a lot of fun and realistic. I would say the animals are a lot noisier, and more densely populated, and leave a lot more signs than they ever do in reality, but you do still have to carefully sneak up on them and mind the wind direction and all of that good stuff to be successful, so it balances out. You wouldn’t want it to necessarily be too realistic or else it wouldn’t make for an exciting enough videogame. I do have some additional nitpicks. First, the game lets you hunt at night that, at least in my neck of the woods, is illegal. It’s also unsafe and not particularly fun anyway. I know this is a game, but it irks me anyway. Secondly, I have run into some glitches with animal behavior such as deer running around in circles, death animations not happening (so the animal just stands there), and just sort of weird stuff. Third, the menus are pretty bad. Having to go back to base to buy supplies and organize your equipment (and make sure you actually put your new stuff into your backpack …) is a pain. I just wish things were smoother and easier instead of everything requiring multiple button presses and menu pages. The presentation in theHunter: Call of the Wild is fantastic all around. The environments are lush and dense with plant life and the lighting and weather effects are absolutely spot on perfect. I also love the little touches like the plants actually getting knocked down when you (or an animal) walk though them so you know where you’ve been. Most importantly, the draw distance is far enough out that you don’t constantly see the forest pop in around you (like in another recent hunting game …). There is still some loss of detail when you’re looking through a scope or binoculars a fair distance away, but it looks okay here. Performance is generally smooth but there are framerate drops when riding an ATV. The sound is also noteworthy because, my word, the ambient forest noises are phenomenal. Tons of different bird sounds and the swaying of trees and whistling of the wind is very well done here. Just sitting in one place and listening to the game is entirely believable and realistic sounding. 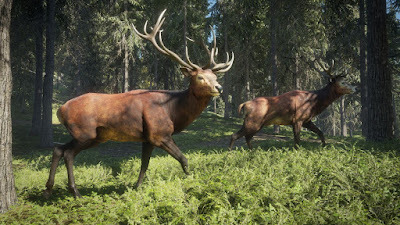 All in all, theHunter: Call of the Wild is a very solid hunting game that fans of the genre will have a great time with. It is more of a hunting simulation than the old Cabela’s games were last generation, which means a lot more walking and waiting and not shooting anything, but it is still a ton of fun and far more satisfying because of it as long as you are patient and embrace it. I don’t especially love the slow grind toward making your character an acceptably skilled hunter and giving them proper equipment, but even that can still be sort of enjoyable even if it is frustrating. 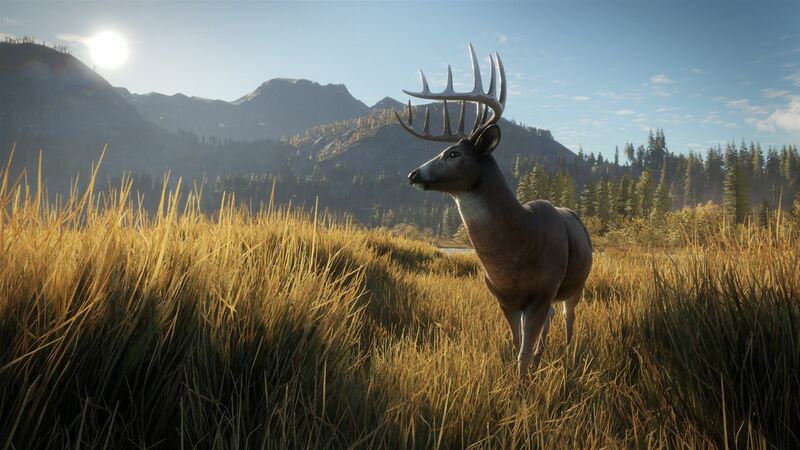 The hunting itself is rock solid and probably the best representation of the sport on a console and that paired with the fantastic presentation make theHunter: Call of the Wild an easy game to recommend. Hunting fans should definitely check it out.